If you just completed your Ordeal at Camp Tesomas this year, we congratulate you! You have just joined Tom Kita Chara Lodge #96, and are now a part of Scouting's premiere honor society. We encourage you to stay involved in your lodge and continue your service in Scouting. We have compiled below a list of information that TKC believes will be helpful in your continued service to Scouting, and your future service to your lodge. You are highly encouraged to check out Jump Start, which will explain the Ordeal process and its backgrounds in the Order of the Arrow. Jump Start also has a section for Brotherhood membership, which we encourage all Ordeal members to take part in after 10 months of membership in the lodge. Chapter Meetings - meet other TKC members in your area and get involved! Lodge Events - listing of upcoming TKC events. 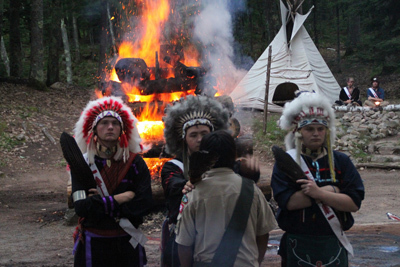 JumpStart for New Arrowmen - a National Order of the Arrow resource for new Arrowmen. Brotherhood Application - get your Brotherhood and seal your membership 10 months after your Ordeal. Information about the Lodge Brotherhood Weekend will be sent to you.